A student has produced a series of vivid photographs that reveal what the networks that keep us connected to the web look like. 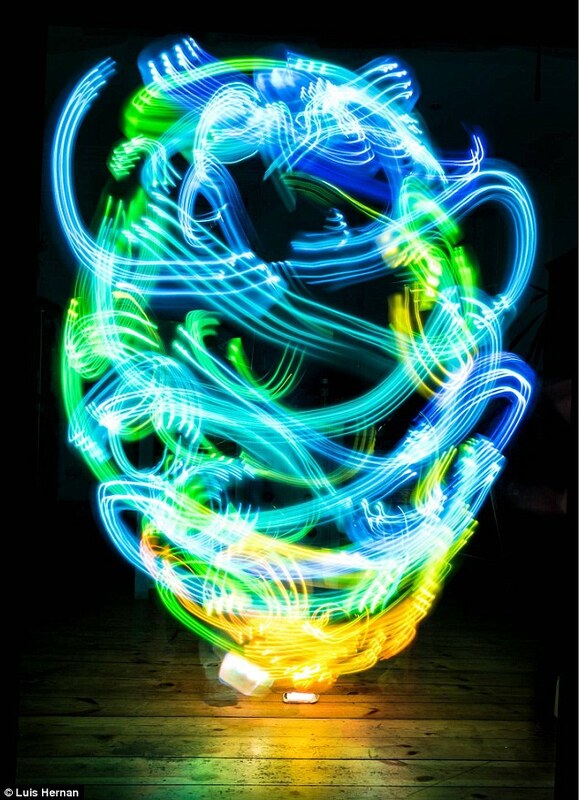 The images, created by Luis Hernan from Newcastle University, show spectres of Wi-Fi sweeping and swirling around in bright beams. They were produced as part of Hernan’s Digital Ethereal project, which aims to bring the invisible world around us to life. Luis, who is studying for a PhD in Architecture and Interaction Design, said he is fascinated with the idea of being able to see the hidden wireless networks which surround us. ‘I call the images “spectres” because wireless networks remind me of ghosts,’ he said. ‘They are there but you can’t see them with the human eye. ‘The fact we are becoming increasingly reliant on something that we can’t see intrigues me. I wanted to find a way to show the wireless which is around us and also to show how it changes. ‘It is an impossibly fragile and volatile infrastructure that holds our digital technologies together, and shapes the way in which we interact with the digital world. ‘Something as seemingly inconsequential as walking around the house will interfere with and reshape their propagation and strength field.